Summer vacation season is nearly here, bringing with it the siren song of sun, fun and the open road. But with the gas prices driving up the cost of travel, and high unemployment making the idea of vacation seem vaguely threatening, it's worth asking if the great American road trip can survive economic hard times. Luckily, DailyFinance's readers have ridden to the rescue. A couple of weeks ago, we asked for your best summer vacation tips and, as always, you responded enthusiastically. In the dozens of e-mails and comments, you offered suggestions for the best places to go, the best ways to get there, and the top ways to make the most of limited resources. Whether you're planning to take a month off or just a weekend, travel across country or around the corner, these hints can help make your summer a blast instead of a bummer. One of the best ways to save money is by planning ahead. 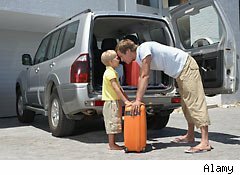 "Pfjw" has raised this to a science by organizing all vacations around a set gas limit: "We decided to take a trip that involved only three tanks of fuel -- meaning all driving had to total approximately 1,500 miles with a little cushion." From his home base in Pennsylvania, this offered dozens of options, from Maine to Asheville, N.C. Of course, it doesn't hurt that Pfjw's diesel vehicle gets better mileage than a standard gas engine. Several other readers suggested short road trips, arguing that they are fun, economical ways to get out of the house without spending a lot of money. "Cbyarley" proposed that readers "take a picnic and enjoy the outdoors." "Alacowboy4646" noted that one of the joys of a short road trip is that "we get back home to sleep in our own beds." "Roma Fay," on the other hand, likes to stay overnight at "modest" hotels, and points out that "Day trips let you discover where you live." Taking the day trip idea a step further, several commenters touted the joys of being a tourist in your own home town. "JVoss13" suggested that readers "Stay at home and spend the gas money on a good dinner or other personal treat." Others noted the economic value of staycations: "Domegrp" wrote that it "boosts your local economy," while "Cctgos" encouraged readers to "put the money that would have been spent on a trip in the bank." "Family" stressed that, in addition to saving money, vacationing in your own town can be a real eye-opener: "Visit the local gardens, museums, historical sights, zoos, parks, go fishing in a river, go swimming at your local pool, have a picnic in a new park or beach nearby ... You will enjoy this more than you think." Lodging is one of the biggest vacation expenditures, and many readers suggested camping as a economical alternative. "Ray" was especially impressed by the cost savings, noting that his family's trip to Alaska will be "about half camp vacation." For the most part, they plan to camp out, but on rainy days or when camping is inconvenient, they will use "TripAdvisor or some other online booking system to find a good room at a good price." Camping can also help with other expenses: "Cbyarley" pointed out that many campgrounds offer on-site cooking facilities, which can help save even more money. He admitted that cooking while on vacation can be annoying, "but, hey, you can save some money." As "Egreen" pointed out, there are other benefits to camping: "It's a great way to introduce your children to nature and involve them in the daily routine of cooking and clean up. All in all, it's a great way for the family to connect." And, even if you don't like tents, commenters noted that there are other camping options. Cbyarley pointed out that many campgrounds rent cabins, and "Matt" suggested that thrifty readers should "Rent an RV!!" In addition to providing convenient accommodations, he notes, RV drivers don't "need to worry about check in and check out times." Several readers suggested their favorite summer road trip destinations. "Family" noted the bargains available in the nation's capital, pointing out that "almost all attractions are free," and that visitors can "Walk all over town, and take the subway only when necessary." Across the Potomac river, "Martha" proclaimed the wonders of Virginia: "You can visit mountains and beaches, the homes of several Presidents, and Civil War battlefields ... If you don't like what you see one day, blink and you will see something different the next day." Further north, "Toddeichas" suggested New York's Finger Lakes region, pointing out that "It has beautiful lakes, great wineries, and affordable accommodations." Michigan was also a particular favorite: "Duby" noted that in addition to great camping, cheap hotels, and clean water, "We border Canada on two sides, so it can be a international trip as well." "Family" went on to praise the numerous beaches and parks, "all for free, or nearly free. You are never far from water here." "Kddamato" suggested the Jersey Shore, while "Jim" recounted a great trip to the South Rim of the Grand Canyon. He was especially struck by the beauty of Havasu Falls: "It's one of the most mystical and magic water shows in the world. The falls are high, the water collects in 20 ft wide stone pools (dozens of them) and is serpentine green in color. The fauna is semi tropical because of the canyon warmth with ferns and humidity ... my wife and two daughters thought this was one of the best vacation experiences we ever had!" Several readers commented on the beauty and value of national parks, and "Deborah" made them the centerpiece of her "three-week cross-country trip." She was especially impressed with the cost savings: "If you like national parks, the Annual passport is a great way to save. $80 gets you into any park all year long." One of the oddest destination suggestions came from "Pete," who encouraged readers to visit Oklahoma for the "100% gasoline, no ethanol and no additives." Pointing out the value of this vacation choice, he wrote that "My 2006 Toyota (EPA 24/30) averages 24.8 mpg using California gas. On Oklahoma gas, I averaged 34.7 mpg, a full ten miles better!" Gas prices were a big concern for many readers. Some, like "Lumleyq45," "Bradsknn" and "Taysmom," noted that they couldn't afford vacations because of the high price of gas. Others, like "Cphaed," noted that one of the best ways to save money was to "drive the speed limit." Meanwhile, "Kddamato" wrote that, by carefully using gas gift cards, he was able to get "$500 worth of gas cards that cost only $400." Several readers also noted the joys -- and savings -- of public transportation. "Roma Fay" pointed out that buses and trains are "very inexpensive," while "Family" suggested that visitors to Washington D.C. stay near the city's metro line. But the most innovative gas saving solution came from "John" who suggested a way to cut gas spending -- and driving -- to zero: "Considering the price of gas and hotels you can go on a cruise with meals included for much less money." Food is another big expense, and several readers suggested ways to save. "Deborah" pointed out that staying at hotels that offer free breakfasts can cut out one meal with minimal added cost. As for lunch, "Oklahoma 10" proposed packing picnic lunches. "Family" expanded on this with a suggestion that covers most meals: "Whether you camp or stay at cheaper motels, carry a laundry basket filled with paper plates, plastic cups, plastic bowls, silverware, paper towels, salt/pepper, condiments, cereal, pop tarts, power bars, snacks, water, PB&J, bread. And of course, a cooler with small juices, sandwich meats, cheese, string cheese, fruit. There is your breakfast and lunch each day, picnics for lunch." As for clean-up, "Ann" noted that damp washcloths stored in Ziploc bags in a cooler "make great 'wipes' for children's faces and hands and are cheaper than store-bought wipes." "Cam5510," on the other hand, argued that store-bought wipes were more sanitary and possibly cheaper. However, she agreed with Ann's decision to put wipes in the cooler, pointing that chilled wipes are great for cooling off children. With money tight and gas prices still high, it's a tough time to take to the road. But, as DailyFinance's readers show, there are lots of ways to get out of town without getting into debt.